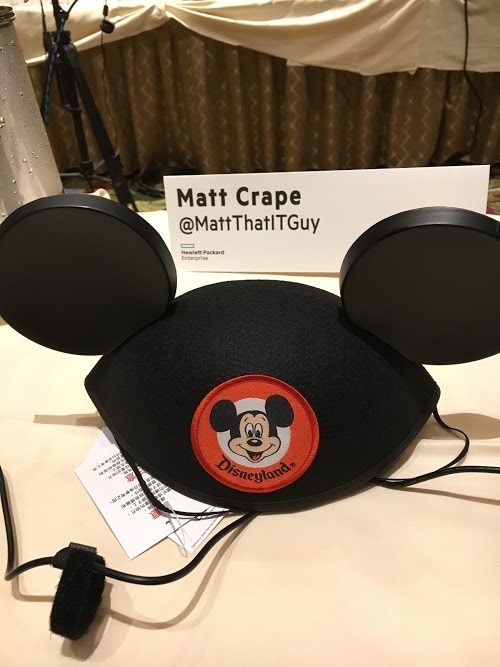 Last month I was invited to attend my first HPE Tech Day held in Anaheim, California. Actually, it was held at the Grand Californian Disneyland Hotel … pretty cool for someone like me who had never been to Disneyland. Although the location was definitely head and shoulders above most events that I have gone to, I didn’t let that get in the way of when it came to assessing what I saw. The event itself consisted of lots of topics by some fantastic presenters. It was very similar in nature to the HPE Blogger event that I attended at VMworld 2017 but longer. Although it has taken me a bit of time to gather my thoughts, there were a couple of areas that really stood out to me that I want to relay some thoughts on. Earlier this year HPE announced its intent to acquire Nimble Storage for approximately $1 billion. Not only was that a decent chunk of change for a startup, it was also one of the faster deals that we have seen closed in recent times. So why Nimble? What made HPE jump on this and execute so quickly? The days of reliable storage selling itself are over. As an industry, storage has been very reliable for quite a while now. Even performance has become a secondary topic of conversation. With flash-based and NVMe-based storage becoming more and more common, the days of peddling IOPS as a reason to buy a solution are all but gone. So if reliability and performance aren’t distinguishing factors, then what are? Management and analytics. This is one area that a lot of “legacy” storage companies are currently dealing with, whereas a lot of startups don’t have the technical debt of “that’s how we’ve always done it” to deal with. Nimble Storage made a big splash with their InfoSight product when they launched it. This isn’t your typical “a hard disk has died” type of monitoring service. Rather, it was built from the ground-up to be a predictive analytical service. With over 800 sensors, these predictions aren’t limited to hardware failure either. An interesting stat from HPE’s web page claims that %86 of issues faced on a Nimble array are automatically predicted and resolved. These issues might be as simple as shuffling data around so that more hot data ends up in the cache. If you do end up needing to contact support, then the team will already have all of the data needed to skip your standard tier 1 questions. The storage admin in me loves to hear this – knowing that I’ll likely have a root cause right away. That, of course, is assuming that the array doesn’t prevent the problem from occurring in the first place. The IT Manager in me loves this as well – less downtime means more uptime. I wouldn’t even call this a self-healing technology, as in a lot of cases it will proactively prevent “bad things” from happening in the first place. From the get-go, most IT pundits assumed that the purchase by HPE was largely for InfoSight. Don’t get me wrong, there is definitely a place in the market for the arrays, and I am sure they will continue to sell well. But InfoSight is the icing on the cake for the deal. There are plans to bring the InfoSight platform to 3PAR and StoreOnce arrays. We still don’t have detail as to what that will look like, but I can almost guarantee that current admins will welcome this new functionality with open arms. From a purely speculative standpoint, it would be quite interesting to see this technology spread across to non-storage lines. Think about what InfoSight would look like when combined with HPE’s Synergy – visibility throughout the stack, regardless of where that stack sits. I wouldn’t expect that anytime soon, but it is worth keeping an eye out for. Matt Leib has written up a great piece on Nimble Cloud Volumes. This is another interesting innovation from Nimble, however I am not going to dive into that at the moment. One other area that I really enjoyed hearing about was SimpliVity. Similar to Nimble Storage, SimpliVity was purchased by HPE earlier this year for $650 million in cash. The Tech Day was largely storage-focused, so why did we have a segment on HCI? Well as we went into more detail, it became clear that a lot of SimpliVity’s magic is in its data presentation. Having a solid underlying storage technology is key for any HCI implementation. It is, however, an area that is ripe for efficiencies. For example, replication happens at the block level. If that the block that is up next for replication is already on the destination side, even if that block is part of a completely different VM, then the block is not actually moved as there is no benefit. We also touched briefly on how SimpliVity fits into HPE’s Synergy project. Given how scalable SimpliVity is, along with its automation tools, it is a great fit. All in all, I was extremely happy with the event. Information was abundantly available. The topics were all on point and delivered by excellent presenters. There was ample opportunity to have on and off-air discussions around the technology, strategy, and the people at HPE. Kudos to Calvin Zito and Becca Taylor, and their team for putting together a fantastic event. The entire HPE Tech Day event is available for viewing on YouTube. Disclaimer: I was invited to participate in HPE Tech Day. All of my expenses, including food, transportation, and lodging were covered by HPE. I did not receive any compensation to write this post, nor was I requested to write this post. Anything written above was on my own accord.